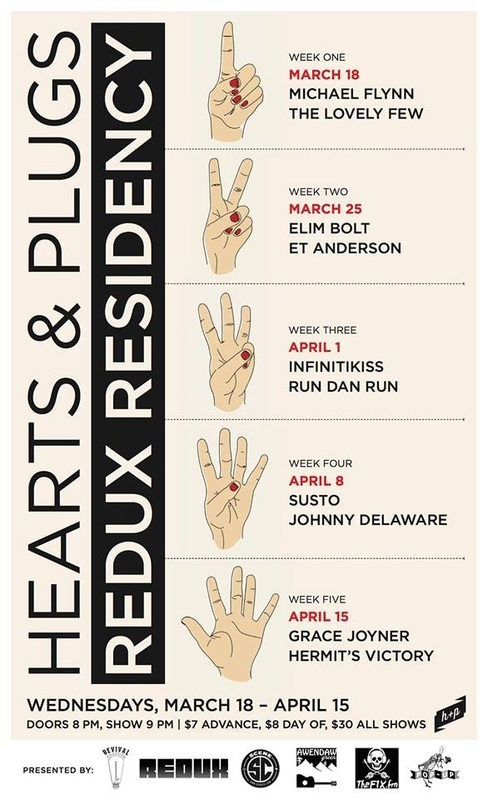 (Charleston, SC Feb. 2, 2015) – On this day of the groundhog, we are thrilled to announce that Revival Entertainment Company will be teaming up with Redux Contemporary Art Center, Hearts & Plugs, Awendaw Green, Pop Up Charleston, Scene SC and The Fix FM to bring you The Hearts & Plugs Redux Residency. This magnificent collaboration will bring you 10 bands over 5 weeks with 3 album releases all being held downtown at Redux Contemporary Art Center (136 St. Philip St.). The shows will happen every Wednesday between March 18th and April 15th with doors opening at 8 PM, and the shows starting at 9 PM. Tickets are $7 in Advance, $8 at the Door, or you can buy a 5 Show Bundle for $30. Hearts & Plugs has built a dynamite roster over the last three years, and we are thrilled to showcase some of the best musicians and bands in Charleston with this series. The bands include: Michael Flynn and The Lovely Few on March 18th, Elim Bolt and ET Anderson on March 25th, Infinitikiss (aka Mr. Jenkins who will be releasing an album) and Run Dan Run on April 1st, SUSTO and Johnny Delaware (who will be releasing a 7” split vinyl with four new recorded songs) on April 8th, and Grace Joyner and Hermit’s Victory (who will be releasing his first album) on April 15th. Not only does this series represent the strong collaborative spirit between the amazing bands in Charleston, but also the communal efforts of the hard working arts presenters, promoters, labels, radio stations, and writers, as we all come together to celebrate the music that makes Charleston so great. You can find more information about all the bands and shows below.